Headquartered in Bad Rappenau, Germany, the company operates eight production facilities and 21 sales offices globally. Losberger De Boer employs over 1,100 staff worldwide. The offering from Losberger De Boer provides wet lease technical support as part of its turnkey operational package, going as far as providing onsite staff who are available seven days per week to ensure utilities as well as maintenance requirements remain fully functioning - a first in the Middle East. The German firm revealed that confirmed orders had already been received and delivered for a major undisclosed Middle Eastern government organisation. One of the challenges faced by defence forces is how to rapidly deploy fully self-contained camps with integrated utilities, ablutions and waste disposal in desert and other remote locations. A further challenge is how to deal with technical faults such as utilities and electricity going down during operations. Another common problem is how to relocate and redeploy the entire complex at short notice minimising impact on the environment. Losberger De Boer’s design teams worked for over a year with specialist suppliers to develop an integrated solution to address these challenges. The result unveiled is its new product known as the Losberger De Boer Military Field Camp (MFC), which differs from standard military camps by integrating all the facilities and utilities that would be expected in an actual military operation, together with onsite technical support to troubleshoot and resolve issues. Losberger De Boer is ISO 14001-certified according to the standardised norms for environmental management systems. Providing improved sustainability credentials, waste and garbage can be treated and removed or incinerated onsite with low impact on the local environment and the entire complex can be rapidly dismantled and redeployed in a new location at short notice, said the statement from the company. The concept integrates over 70 different products, including inflatable self-erecting tents, metal frame temporary structures, modular half barrel buildings and sun screens. Containerised ablutions and utilities blocks are added together with portable waste disposal facilities. The entire complex is scalable and can be customised to the unique needs of any defence force. For example, temporary aircraft hangars can be added for air force users and vehicle and weapon storage for ground forces, said the global military structure specialist. All buildings can be temperature and humidity controlled, including storage areas and plant rooms, which can help extend the lifespan of the equipment stored and reduce their maintenance cost by up to 30 per cent, it stated. 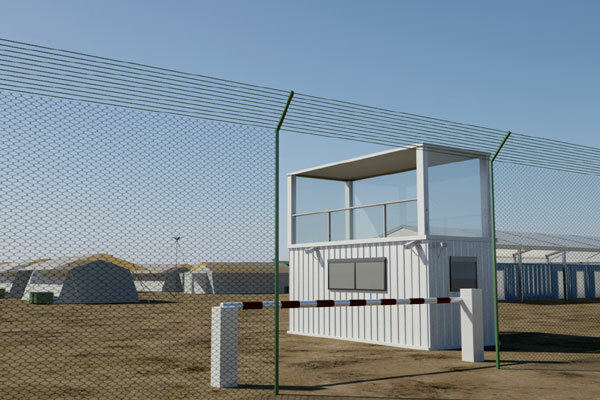 Jim Muldoon, managing director of Losberger De Boer Middle East, said: "We believe our new integrated concept is a game changer in the temporary military camp space. When government and defence forces need to act quickly for training, regional deployment or on critical missions, we can now provide a rapid-build solution with improved, functionality and sustainability credentials." The Losberger De Boer Military Field Camp can be ordered off-the-shelf and then customised to the individual needs of clients with onsite technical staff fully trained prior to deployment, said the top official.